When you think of the Paris metro, you probably have in mind one of the typical Art nouveau entrances designed by Hector Guimard. Well, he did not do them all... Hence this one, near Place Monge, located at rue de Navarre, probably one of the oldest streets in Paris (it takes you to the famous Lutèce arenas, that were built by the Romans, when they used to live in "Paris" - which was called Lutèce at that time). I did not find any information about this station - who built it - but I really like it. I like it also, have never seen it before. I love these hidden gems in the 5th. There is a way to get to Arenes de Lutece through a building of Rue Monge. Pretty cool and many people will walk right past it without knowing it's there, because it's so counter-intuitive to get in there. My school is not too far, and so are the universities (Jussieu, etc.). Good memories. Thanks, Eric. Love the photo - hate the spam. The stone work is very nice. Happy belated Valentine's Day to all! Wow. 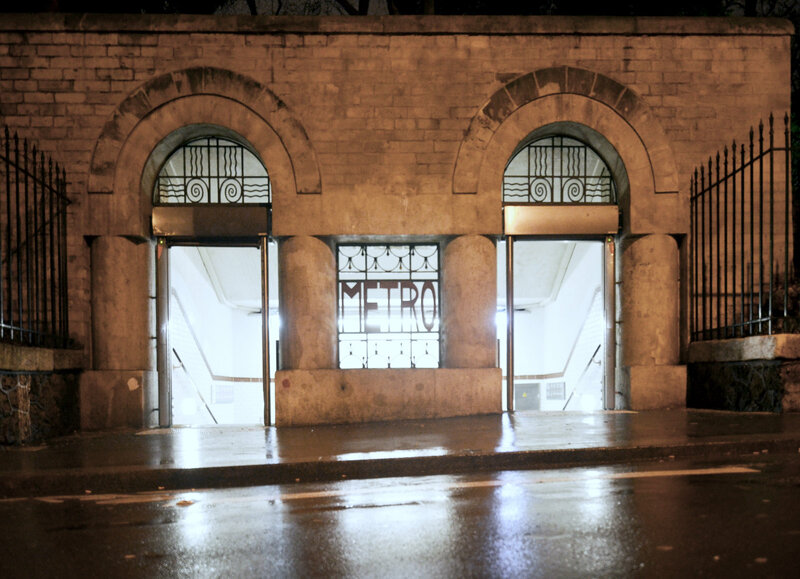 I emerged from the Place Monge Metro only once, a number of years ago. I don't remember this portal. Really cool. Beautiful Art Deco. Thank you for sharing. To "Anonymous" : Yes it is easy to get past those Arènes, unfortunately. It is a great place to visit, off the city noise one can imagine Lutèce quite easily. I sat there once and "inhaled" the atmosphere of the ancient city and have kept a great souvenir ever since. Eric : doesn't "Blogger" offer a spam control device ? I've seen people having to put their blogs on hold for quite some time after getting overwhelmed by spams. @Arr Day "Eric : doesn't "Blogger" offer a spam control device ? " Yes it does and I have activated it. But only on older posts (that is where I had the most spam). On daily posts I don't want to activate it, because it's a captcha thing and it's a real nuisance. I rarely have spam on my post of the day though, so it's controllable. I think I've walked past this station while looking for a metro because it doesn't look like one. I love the way this station is "hiding" in plain sight! Sorry you've been plagued by spammers—I think a lot of us have been lately. I love this!! It's really beautiful! Thank you so much! Aha! I didn't read carefully. This entrance is a full block away from Place Monge. There it is! This really is great. It's a very discreet Metro entrance ~ almost looks like they sell bootleg liquor in there! I really like it, too. Love the art nouveau style! In 2008, we stayed in an apartment just up the street from this Metro entrance. While we rode the metro almost daily for our 17 days there, we only used this entrance one - even though it was just steps from our apartment. It has lots of stairs and a long walk. Instead, we would walk up Rue Monge to another entrance with an escalator! It felt a little deserted as we rarely saw anyone else going in and out. I will make sure to use this entrance at least once this time in honor of your beautiful photograph! I must see this on my next visit!